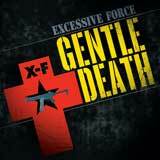 Excessive Force (XF) began as a solo project of sorts for KMFDM founder and leader Sascha Konietzko. The period between 1990 and 1992 saw a mass of creative output from Sascha K. thanks to the deluge of inspiration he gleaned from his first forays across the US. He was looking for an outlet that would allow him to capture some of this outpouring of ideas that would not interfere with a marketplace already crowded with KMFDM releases. This endeavor quickly morphed into a partnership between Sascha K. and Buzz McCoy of My Life With The Thrill Kill Kult. The two also enlisted the talents of those around them during that fateful summer in Chicago and fall in Hamburg. Shortly after the XF sessions the KMFDM/TKK Nave/Days Of Swine And Roses split remix single was released to a huge reception by fans of both bands. The time was right for a showcase of their commingled talents. The Conquer Your House single was released in mid-1991 followed by the Conquer Your World album later that year on the fabled Wax Trax! Records label. The music became an underground Electronic House sensation. Feeling the project and its result very freeing Sascha found himself wanting to return to that XF format (which was a decidedly different process from making a KMFDM record) in mid-1992. Once again laboring on his own and with various friends in Chicago and Hamburg, Sascha crafted another genre-bending collection of songs. The most defining collaborations on the release are the tracks featuring the vocal talents of Liz Torres, the Queen of Chicago House music. The Gentle Death album and Blitzkrieg single were released by Wax Trax! in mid-1993 to the delight of industrial music fans and dance-floor demons alike. Excessive Force has remained dormant since that time, until now. Their original releases, having become much sought after items since going out of print a decade ago, were made available once again via Metropolis Records. Both XF albums were digitally re-mastered, the accompanying CD booklets reprint the original album and single art inside along with extensive liner notes, never before printed lyrics for each song, previously unavailable complete recording information and never before released or rarely seen photos of XF. The two CDs comprise the entirety of Excessive Forces output. The Conquer Your World CD now contains the Conquer Your House single and the Gentle Death CD contains the Blitzkrieg single. 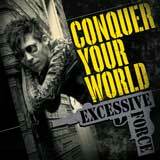 Excessive Force is a violent peace that is set to conquer the world once again.